Johnny's Garden is drenched in natural light thanks to floor to ceiling windows. Wood ceilings and floors and the large, floating, wooden staircase give this spacious home an airy yet warm ambiance. This popular two bedroom, two bath home is situated just one and a half blocks from the beach and four blocks from Manzanita Village. The master bedroom downstairs has a queen bed, dresser, end tables, reading lamps and an en suite bath with double sinks and large, soaking tub. The soaking tub is surrounded by clear story windows and has a skylight for those cold and rainy days when playing on the beach is not an option. The second bedroom is spacious with a double bed, large dresser, end tables and reading lamps. There are also twin bunk beds in this spacious room and an en suite bath with shower. The well-equipped kitchen is perfect with all the room you need to prepare great meals with the family. It overlooks the kitchen and dining area which makes for great family interaction. The house is fully stocked with games, movies and WIFI. For those sunny days, the bikes in the garage are a great amenity along with the private back deck, BBQ and comfortable, outdoor seating. This home accepts one dog per reservation. Come experience Manzanita, a hidden treasure, this magnificent part of the Oregon Coast and our lovely, cozy cottage! 1 dog under 40 pounds, must be at least two years of age, and flea treated. No cats please. If youre staying on the northern Oregon coast, Manzanita is the place to be, and if youre staying in Manzanita, this house is awesome. It is extremely close to the beach, and to the little downtown area where there is a bar/grocery/restaurants (2-5min walk). Youre only a short bike ride (5-10 minutes) from Nehalem Bay State Park, or a short (beautiful) drive from any number of other attractions along the Oregon coast. The house itself is gorgeous, with huge windows and really nice wood-working. The downstairs bathroom makes you feel like youre sitting in a forest. The little deck (w/ propane grill) is like a mini-retreat within the property itself. I did yoga on the deck after morning runs during my stay, and then grilled up gourmet meals in the evening. This house is on the north side of town, which is better because there are way more trees, creating a more peaceful setting. This house is perfect for families looking to get away for a weekend, or athletes looking to do a coastal training camp. The price is absolutely right. Johnnys was a cozy spot for a spring getaway to Manzanita. The owners are clearly very thoughtful, as everything we would have wanted was there. A quick walk to food/beach, and lots of light, too. Cant wait to go back in the future. The property was extremely clean and well maintained. The home was very nice and the location was great. The guest services team was very helpful and answered all of our questions. Even in the very beginning, when we had to reschedule our dates due to a vet emergency, they we super understanding and accommodating to our needs. Thank you! 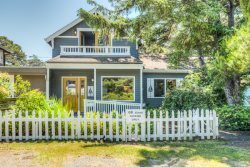 In our visits to Manzanita, over the last 15 plus years, we have stayed at a variety of different properties. This was the first time that we have stayed at Johnny's Garden and we are happy that we tried a new spot, and, that it was available for our weekend. We will definitely return to this house for future visits! We loved all the big windows and the views out through the trees. We also liked the fact that it is off the main roads and to the north side of the main central Manzanita area. Always respond promptly, always very helpful. We have stayed at the property many times over my wife's birthday weekends. We love everything about this house and will keep coming back. First, It is a truly beautiful house full of windows looking our on cedars, firs, pines and flowering bushes. Plenty of comfortable seating in a beautiful sunny second level living room. Hard wood floors throughout, plenty of kitchen utensils and a very nice collection of cooking staples mean that one is comfortable from the beginning of the visits. Very quiet house. Bunkbeds and queen size bed in the upstairs was perfect for grandchildren and their parents. Furnished with childrens' books, wooden blocks and animals, Legos, games. and plenty of good games and wonderful books for adults. Good internet. Also beach chairs and beach toys were very much appreciated by all. Beautiful shady deck with grill and downstairs bedroom with a very nice, large bathroom. Short walk to the beach which is slightly north of where the Laneda crowd and much less crowded and closer to the beach. We plan to rent again especially if we come up with family again. After nine years fo coming to Manzanita, this is our clear favorite house of many nice housed we've rented. Just perfectly wonderful. Many thanks for sharing your lovely home. The back deck was excellent and honestly where we spent most of our time whole in the house! Wonderful beach house! Close to beach and town. House had all the amenities we needed.